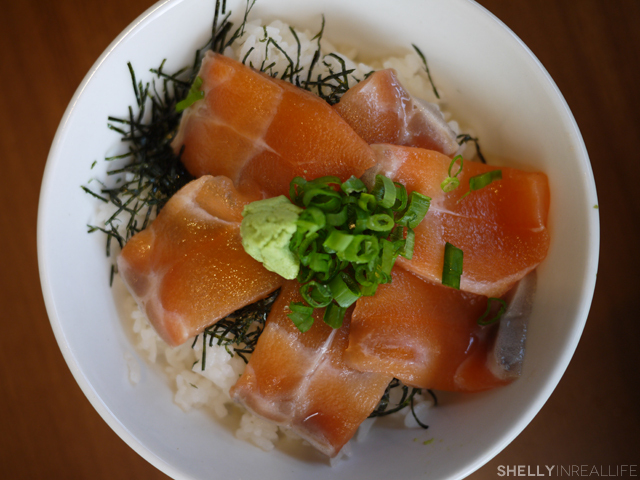 Enough of a distraction from NYC Eats, this is the 3rd post in my LA Food Tour, Spring 2013 series. Previous post includes Kang Ho Dong Baekjeong (the best Korean BBQ ever!) and Manhattan Beach Post. Before Tsujita LA, I had never even heard of Tsukemen Ramen. But this dish has made me a believer and now it's a must-have everytime I go to LA. 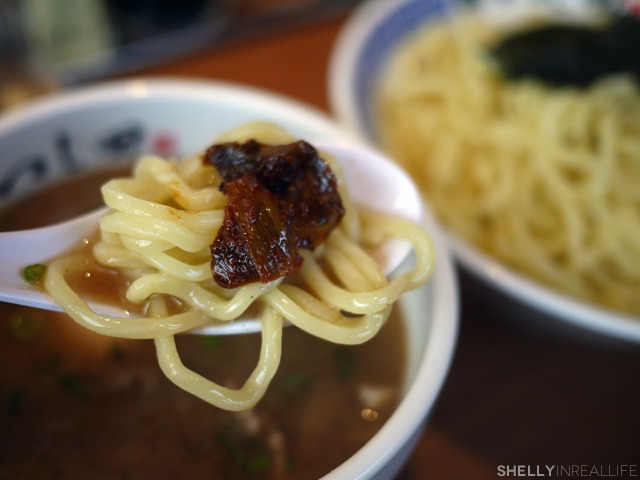 Tsujita LA is known for their tsukemen ramen which is served only during lunch. 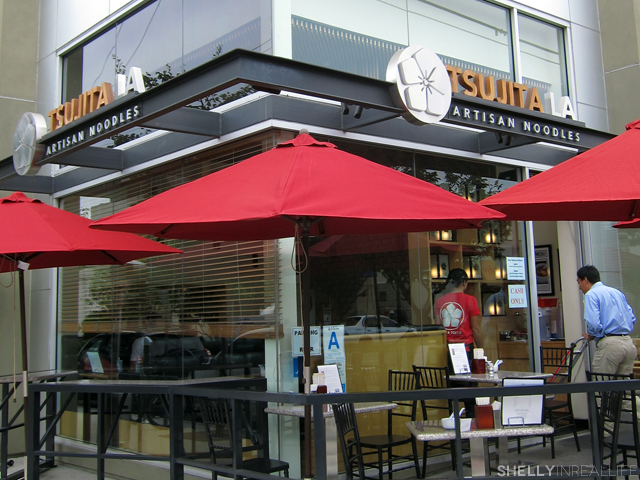 Everyday at 11 AM, Tsujita opens their doors and within a few minutes, there will usually already be a waitlist. There are around 15 tables including outside seating, so unless you come right on time, you should be prepared to wait for at least for half an hour or possibly longer. 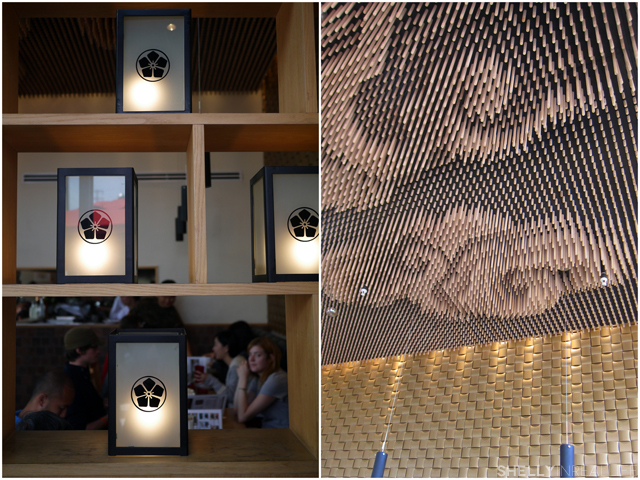 Also, lunch ends at 2 PM, so get your name down on that waitlist or no tsukemen ramen for you! 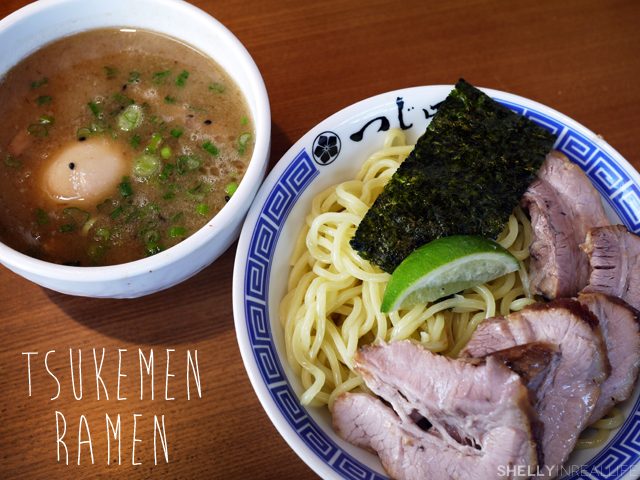 So what is tsukemen ramen exactly? 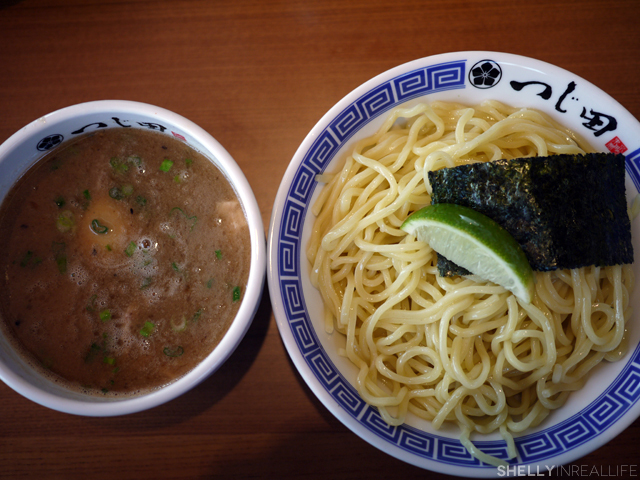 Tsukemen is dipping ramen where a thick broth is served on the side, for dipping's sake. The tonkotsu broth is cooked for 60 hours, and at the end, seafood is added to the broth to give it a thicker consistency with more umami flavor. 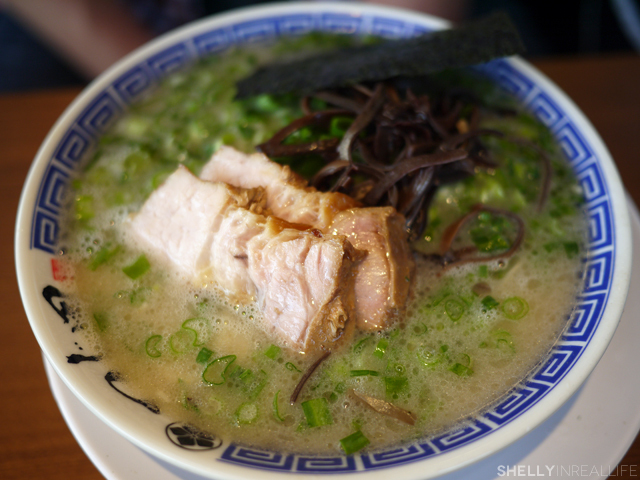 Tsujita finishes off this broth with bits of wood ear mushrooms, pork and scallions. It soup is rich in flavor, so rich in fact that it's really not meant for you to drink it or else you might find it too salty! This is where the thick and chewy noodles come in. The noodles actually take a bit more time to cook than regular ramen because it's much thicker, but the noodles works perfectly with the dipping broth since it helps soften how salty the broth is. Each bite of the ramen has a distinct bounce to it. Love! 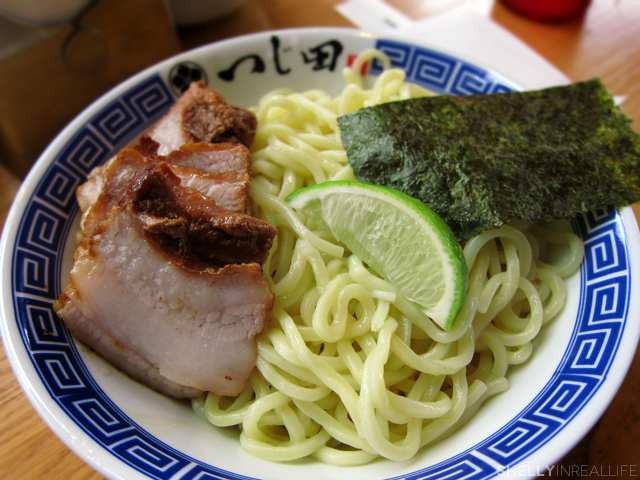 There are two types of orders for the tsukemen - one with or without the extra char siu - and for good reason, the entire meal is so rich that you really might be too full to eat the extra pork. Of course eating with J means he will always order the extra pork, and I get a piece of it! Score! But seriously, I wouldn't order the char siu if you're not a big eater. There's enough bits of pork inside the broth that makes it okay without. 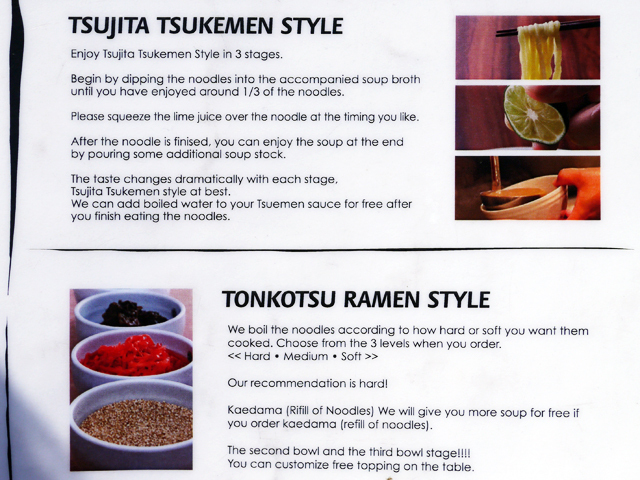 It is recommended that you eat your Tsukmen ramen in a few stages. First, you eat the noodles plain, with only the dip in the broth. Then, my favorite part, is that they give you lime juice to squeeze over the noodles. 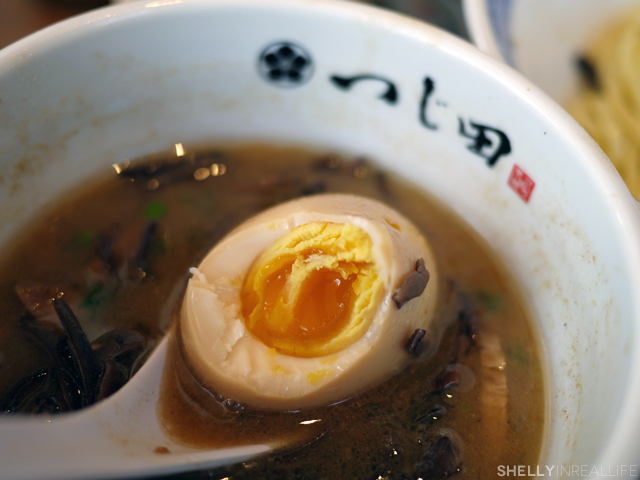 The acidity really helps cut through some of the fatty flavors of the broth and enhances it - probably helps you get through the rest of your noodles too. I love lime in my food, so I always add it right at the beginning. In addition to the lime, they give you a huge set of condiements so that you can flavor the meal to your liking. I especially love putting the hot leaf mustard in with my noodles! Also, I recommend ordering their egg on the side which is perfectly cooked to a medium boiled egg, just a bit uncooked in the center. If you are craving for the tradtional ramen that you know and love, don't worry, you can order that was well (pictured above). The tonkotsu broth gets the same 60 hour treatment as its tsukemen counterpart except it is more clear and not as thick and salty. 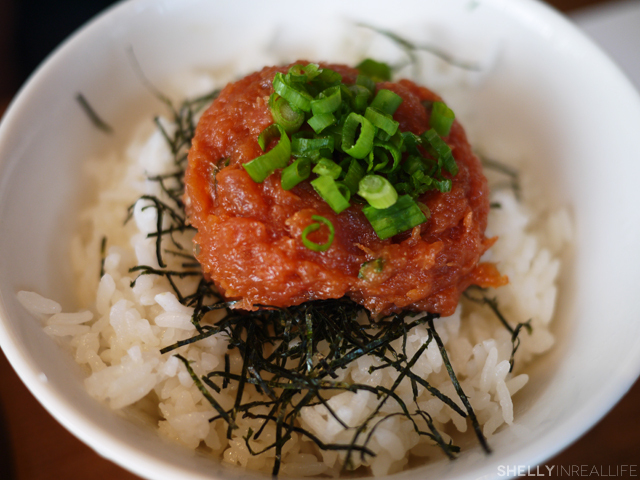 And what's a good Japanese meal without the extra combo of A spicy tuna don and sake don on the side? All yours for an additional $3.99. The next time you are looking for good eats in LA, please do me a favor and grab a bowl of tsukemen at Tsujita LA between 11AM-2PM. I promise you won't regret it.